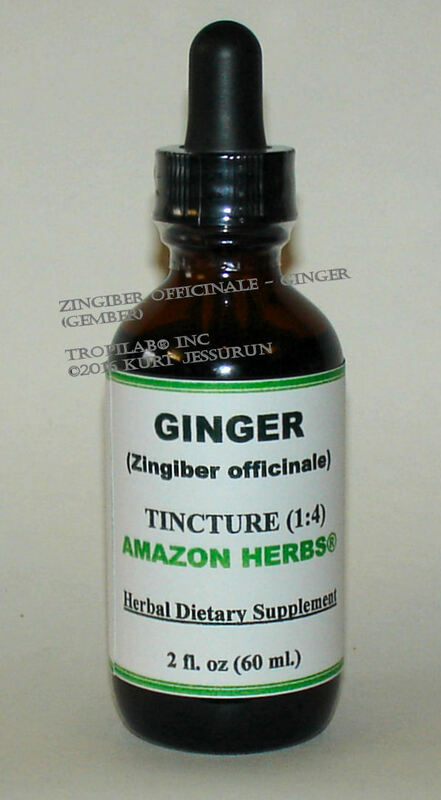 GINGER ROOT TINCTURE against motion sickness and nausea - TROPILAB. 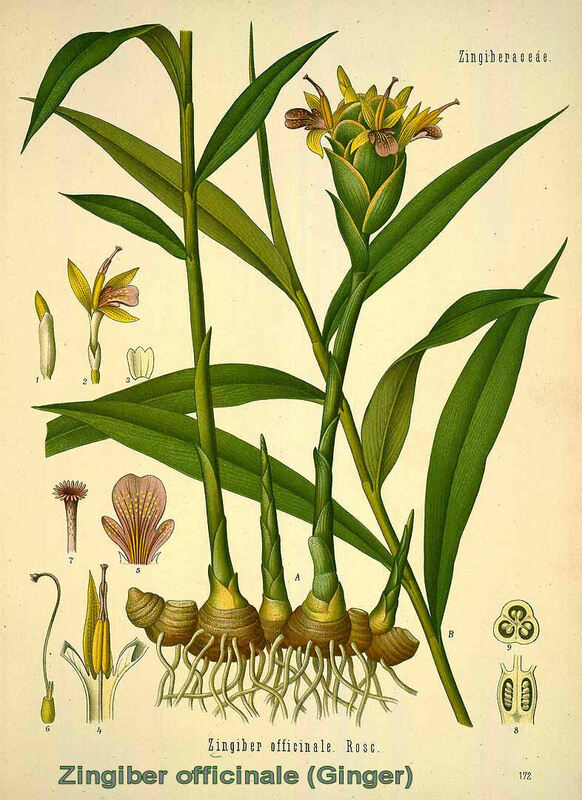 The rhizome (underground stem) of Ginger is used as an aromatic carminative and pungent appetite stimulant; it is also a remedy for digestion. Ginger is effective against nausea and vomiting associated with motion sickness, pregnancy, and postoperative recovery; it also may be effective and safe for chemotherapy-induced nausea and vomiting. It may effectively be used for patients who continue to experience delayed nausea and vomiting despite treatment with other less effective anti-nausea drugs. Ginger is an effective pain-killer against chronic knee pain. It is suggested that it is also effective against post-workout pain. It also prevents blood clots, probably better than aspirin and also helps reducing the levels of LDL cholesterol and triglycerides that clogs arteries. Volatile oils (bisabolene, cineol, phellandrene, citral, borneol, citronellol, geranial, linalool, limonene, zingiberol, zingiberene, camphene), Oleoresin (gingerol, shogaol), Phenol (gingeol, zingerone), Proteolytic enzyme (zingibain), Vitamin B6, Vitamin C, Calcium, Magnesium, Phosphorus, Potassium, Linoleic acid. The pungency of ginger is due to GINGEROL which is the alcohol group of the oleoresin. Ginger owes its aroma to about 1 to 3% of volatile oils; these are bisabolene, zingiberene and zingiberol. Anti-inflammatory: gingerol is capable of suppressing the inflammatory effect of severe arthritis when treated with Ginger oil. Ginger may help, suggests a study published in a recent issue of Osteoarthritis Cartilage. Anti-tumor: this is one of the herbs possessing the highest anti-tumor activities. Gingerols (chemically, gingerol is a relative of capsaisin) are the main active components in Ginger and responsible for its distinctive flavor, it may also inhibit the growth of human colorectal cancer cells. Antioxidant: A number of animal studies have shown that Ginger lowers cholesterol levels. Experimental animal data suggest a strong positive effect of the Ginger on plasma lipid composition that may be important for the prevention of atherosclerotic events. Motion sickness: for preventing seasickness and motion sickness. It is superior to the prescription drug Dramamine (dimenhydrinate) in this regard. Nausea: prevent postoperative nausea and vomiting in women. For women looking for relief from their nausea, dry retching, and vomiting, the use of ginger in early pregnancy will reduce their symptoms to an equivalent extent as vitamin B6. By relieving nausea (a common side effect in the conventional treatment of hepatitis, ginger has the potential to help patients tolerate interferon and ribavirin, which can increase their changes of a successful Hepatitis C treatment. The substance that gives Zingiber officinale its flavor (gingerol) may inhibit the growth of human colorectal cancer cells, according to research at a major meeting of oncology experts in the US. Ginger compounds may be effective chemo preventive- and /or chemotherapeutic agents for colorectal carcinomas. Plants of the Ginger (Zingiberaceae) family have been credited with therapeutic- and preventive properties and have been reported to have anti-cancer activity. Ginger (Zingiber officinale and Alpinia galanga) extract may be useful in delaying the onset and the progression of neurodegenerative disorders involving chronically activated microglial cells in the central nervous system (the neuron loss in Alzheimer's disease). For all applications make a tea (1 tea spoon / cup). Let the tea simmer for 10 - 20 minutes. See also our CCG tincture page. Tincture: 2 - 4 ml. daily (1 - 3 full droppers). Against cancerous tumors: 2 - 4 ml daily. Ginger is an effective natural blood thinner and can enhance the anticoagulant effect of Warfarin (Coumadin), leading to an increased risk of bleeding. H2-blockers / Proton pump inhibitors: Ginger may antagonize activity by increasing stomach acid production. Antihypertensives: Ginger may cause additive hypotensive effects. Hypoglycemics / Insulin: Ginger may cause additive reductions in blood glucose. � Akoachere JF, Ndip RN, Chenwi EB et al. / Antibacterial effect of Zingiber officinale and Garcinia kola on respiratory tract pathogens. East Afr Med J. 2002 Nov;79(11):588-92. � Bode A. / Ginger is an effective inhibitor of HCT116 human colorectal carcinoma in vivo. Paper presented at the Frontiers in Cancer Prevention Research Conference, Phoenix, AZ, Ocbober 26-3-, 2003. � Ensminger AH, Ensminger, ME, Kondale JE, Robson JRK. / Foods & Nutriton Encyclopedia. � Ensminger AH, Esminger M. K. J. e. al. / Food for Health: A Nutrition Encyclopedia. Clovis, California: Pegus Press; 1986. � Ficker CE, Arnason JT, Vindas PS et al. / Inhibition of human pathogenic fungi by ethnobotanically selected plant extracts. � Fischer-Rasmussen W, Kjaer SK, Dahl C, et al. / Ginger treatment of hypereesis gravidarum. Eur J Obstet Gynecol Reprod Biol 38(1990):19-24. � Fortin, Francois, Editorial Director. / The Visual Foods Encyclopedia. � Grieve M. / A Modern Herbal. � Ippoushi K, Azuma K, Ito H, Horie H, Higashio H. / -Gingerol inhibits nitric oxide synthesis in activated J774.1 mouse macrophages and prevents peroxynitrite-induced oxidation and nitration reactions. Life Sci. 2003 Nov 14;73(26):3427-37. � Jagetia GC, Baliga MS, Venkatesh P, Ulloor JN. / Influence of ginger rhizome (Zingiber officinale Rosc) on survival, glutathione and lipid peroxidation in mice after whole-body exposure to gamma radiation. � Kiuchi F, et al. / Inhibition of prostaglandin and leukotriene biosynthesis by gingerols and diarylheptanoids. Chem Pharm Bull 40 (1992):387-91. � Nature Immunology Online. / Nature Immunology Online. 2001;10.1038/ni732. � Srivastava KC, Mustafa T. / Ginger(Zingiber officinale) in rheumatism and musculoskeletal disorders. � Srivastava KC, Mustafa T. / Giner (Zingiber officinale) and rheumatic disorders. Med Hypothesis 29 (1989):25-28. � Wigler I, Grotto I, Caspi D, Yaron M. / The effects of Zintona EC (a ginger extract) on symptomatic gonarthritis. � Wood, Rebecca. / The Whole Foods Encyclopedia. New York, NY: Prentice-Hall Press; 1988. For many of the conditions discussed, treatment with prescription or over - the - counter medication is also available.